The economic recession of the late 2000s resulted in the political status quo in Ireland being completely thrown when Fianna Fáil was reduced to 19 seats in the 2011 general election, behind both Fine Gael and the Labour Party for the first time. A year prior, the similarly embattled Labour government in Britain had seen itself lose power in the 2010 UK general election. Although British Labour's drubbing was nowhere near as severe as what happened to Fianna Fáil, Gordon Brown's party lost over 90 seats and found themselves second to David Cameron's Conservatives. None of the three main British parties had enough seats to form a government on their own, and a week of ambiguity and speculation ended with the Conservatives entering into coalition with the Liberal Democrats. 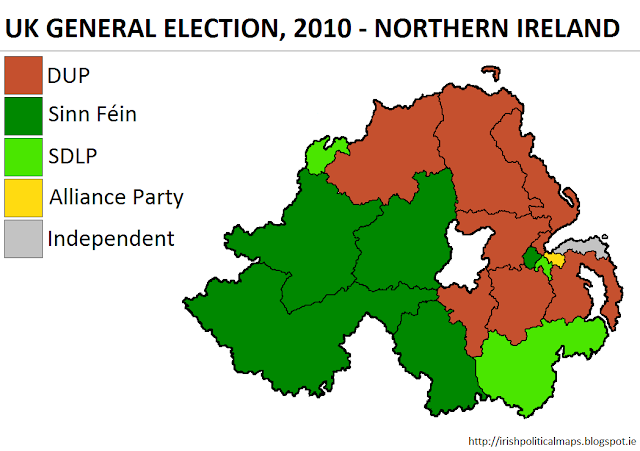 As is typical, however, none of these parties were relevant as far as the election in Northern Ireland was concerned. Whatever about the power shifts taking place in Westminster, or even in Leinster House the next year, the people of Northern Ireland were not expected to change their voting habits to any drastic degree. Nevertheless, there were two big surprises. Ulster Unionist MP Sylvia Hermon of North Down announced that she would be standing for re-election as an Independent, in protest at the UUP's increasingly close relationship with the Conservative Party. Hermon was re-elected with 63.3% of the vote, with the replacement Conservatives and Unionists candidate Ian Parsley coming a very distant second at 20.4%. The loss of the UUP's only remaining Westminster seat was not the biggest surprise, however. In a very disappointing upset for the Democratic Unionist Party, its leader - and the First Minister of Northern Ireland - Peter Robinson lost his Belfast East seat to Naomi Long of the Alliance Party. Long won 5% more of the vote than Robinson, giving Alliance its first Westminster seat. Besides these two changes, every other seat remained with the incumbent parties. In the immediate aftermath of the election, when Brown and Cameron sought to negotiate coalition deals for their parties, there was some discussion of a Labour-led coalition with the Liberal Democrats, which would have required the SDLP, the Alliance Party and the UK Green Party to reach a majority. Such a proposal never moved past mere speculation, and the Conservatives and Liberal Democrats agreed a coalition deal in the week after the election. Despite his loss, Peter Robinson remained leader of the DUP and First Minister of Northern Ireland.